With Our Tax Planning and Preparation—You'll See the Difference at Year End! 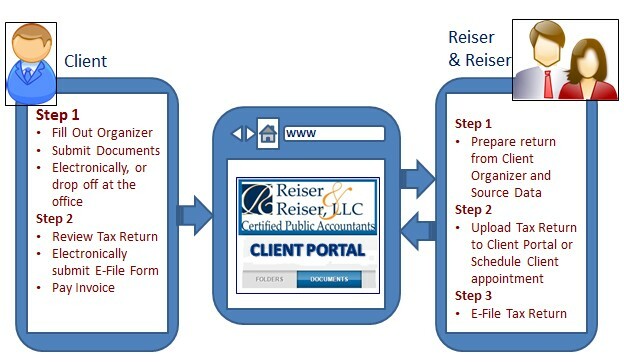 Reiser & Reiser, LLC excels in tax planning and preparation for S-Corporation, C-Corporation, Partnership, and Individual tax returns. We understand how a heavy tax burden negatively impacts a business’s cash flow. Our goal is to reduce your tax liability, freeing capital to re-invest or take advantage of future opportunities. To make the tax process as convenient and pain-free as possible, we offer all our clients a secure portal on our web site where tax documents can be reviewed and electronically housed. You have 24/7 access to all your financial information via the internet. We E-file all returns as well.